Allan S. Roth is the founder of Wealth Logic, LLC, a boutique financial planning and investment advisory firm that presently advises on $500 million in assets for 100 clients. Roth is an adjunct finance faculty member at Colorado College and teaches behavioral finance at the University of Denver's Graduate Tax Institute. He is an expert in portfolio construction and performance benchmarking. Introduction: The Seeds of Financial Success. Chapter 1 The Claw Will Take Your Money: "10 – 2 = 8". Chapter 2 Own the World: "Don't Put All of Your Eggs in One Basket". Chapter 3 The Advantage of Having Wall Street Marketing Blinders (and Where Can I Get Some? ): "I Don't Watch Cramer; I Like SpongeBob". Chapter 4 Adults Behaving Badly: "Don't Act Silly When Something Is Important". Chapter 5 Can You Beat a Second Grader's Portfolio? : "I'm Not Going to Win All Three Spins". 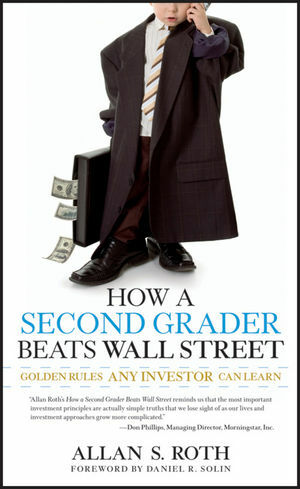 Chapter 6 Beyond the Second-Grader Portfolio: "If Dad Says There's a Better Way, I Might Try It, but I'm Not So Sure". Chapter 7 Bonds—Your Portfolio's Shock Absorber: "Don't Lend Money to Someone Who Won’t Pay You Back". Chapter 8 Better Than Bonds: "If the Teacher Promises You’ll Be Paid Back, Then It's Okay to Lend Randy Money". Chapter 9 Simply Brilliant or Brilliantly Simple—Building Your Portfolio: "Don't Bet Your Lunch Money". Chapter 10 Investors Who Love to Pay Taxes, and the IRS Who Loves Them: "Don't Pay Taxes If You Don't Have To". Chapter 11 Nightmare off Wall Street—The Scary Tale of Trick-or-Treat Investing: "If the Game Is Too Hard to Understand, I'm Not Playing". Chapter 12 Increase Your Return No Matter What the Market Does: "If You Pick the Low-Hanging Fruit, You Don't Have to Climb the Tree". Chapter 13 Keep It Simple, Stupid (KISS): "Why Do Grownups Have to Make Things So Complicated?"